The event is at 11:30 a.m. at the Hilton Garden Inn Fayetteville, 1325 North Palak Drive. 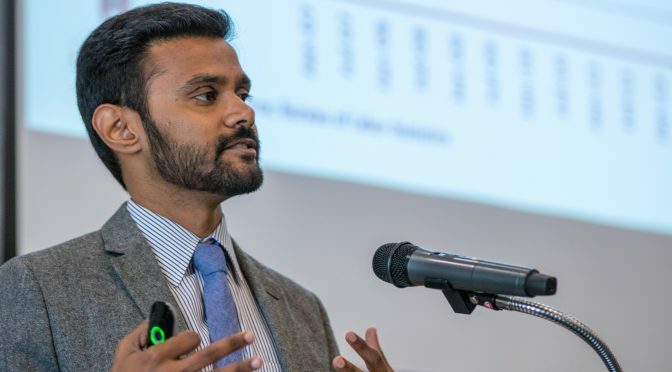 “The program will take a look at new economic data, tax cuts, tariffs, interest rate adjustments and other factors and their effect on short-term and long-term growth for the nation, Arkansas and the region,” Jebaraj said. “Even in a growing economy, changes in policy and a daily flow of new information can shift the economic outlook. “The program also will take a deep dive into what kind of pressure Northwest Arkansas’ growing population is putting on affordable housing in the region,” he said. The Quarterly Business Analysis program builds networks of leaders from business, academic and governmental sectors in the region while addressing business highlights of the previous quarter, key economic trends and projections and immediate and long-term issues facing the regional and state economy. The program lasts for approximately 75 minutes, including time for questions and answers. Registration and networking will begin at 11 a.m. The cost for the Quarterly Business Analysis program and luncheon is $40. Preregistration by Monday, May 21, is required. Reservations can be made for the luncheon at cber.uark.edu or by calling 479-575-4151.